We are proud to say that the �ahin Palace Apartments are a family run business and have been so since 1994. We offer a very high quality, friendly and hygienic service meeting the needs of all our guests. The �ahin family would like you to come and share the colours of an unforgetable and beautiful holiday. 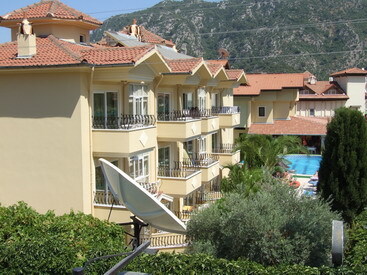 �ahin Palace Apartments are in ��meler village which is facing the Mediteranian sea. With it's sparkling sea and bays like embroderies you can take in the fresh pine scent in the air. There is a choice of Self Catering or Bed and Breakfast at very reasonable rates. ��meler has a local population of approximately 9500 citizens and is situated 8 klms from the larger town of Marmaris. ��meler has a regular bus service to Marmaris which takes approx 15 mins or if you fancy a nice walk you can take the scenic route along the coast. Don�t forget ! �Sahin Palace Apartments are ; Your home in I�meler� Hope to see you soon. Stay with us.